I am so excited to launch a new series which I am calling "ECO MAMA MUSE". In it, I hope to turn the spotlight on rockstar mamas who are working hard to make non-toxic living easier for parents like you and me. My first every Eco Mama Muse is a woman I admire SO much and that I know you will love too: Amy Ziff . Amy, like so many of us, deepened her non-toxic journey after becoming a mom. Her twins were allergic to everything ( creams, lotions, diapers, breast pillows etc) and so she did what most of us moms do when we become new moms: she started researching and she learned- what by now many of you that follow Non-toxic Munchkin might already know- that the hundreds of products in our homes that we use every day—from baby balm to beauty creams, kitchen accessories to furniture—can contain toxic chemicals that can affect our family’s health. Furthermore she realized our government was failing at protecting us and that it was really, really, really hard to know which products are truly safe from which are not. She decided that things had to change and she set out to change them herself and so founded Made Safe. Today MADE SAFE®, is hands down THE strictest, most rigorous eco certification process available. The best part for parents like you and me? 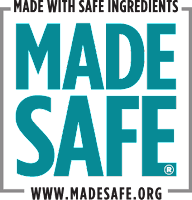 Made Safe Certification isn't limited only to one industry, instead it covers everything from mattresses to personal care products, cleaners to feminine care and toys . Personally, when I see their seal, I breath a sigh of relief because I don't have to spend hours looking for and then research all the ingredients. When I see the Made Safe Certified seal I know it truly is made with the safest ingredients - period. 1. What inspired you to start Made Safe? The answer is really simple: it was my kids. I have three children and after my first was born I had twins. When I brought them home from the hospital they were allergic to everything. I mean things I had no idea you could be allergic to: they were allergic to diapers and wipes and lotions and things the hospital had sent me home with. They were vomiting when I used a certain breast feeding pillow, they were breaking out in these really horrible rashes and things that looked like burns on their body and I thought "What is going on?How is it possible that the stuff that I am using is making my kids physically sick." Then I thought, "How do I stop it, What do I do?" and so, I very quickly learned, as many moms out there before me and since have, that all of the stuff that we use each and every day is made with a ton of toxic ingredients and there is just no labeling required and if you want to know what is in your stuff you have to get pretty serious about decoding what is on a label, what isn't on a label, and everything in between. And I just thought :"there has to be a better way." So I started to learn about chemicals and ingredients and working with scientists and putting together a way of working with brands under NDA to know all of the things that might not be on labels to really decipher and decode and deconstruct what is in a product, what has been done to that and will it harm humans. That means: will it build up in your body, will it build up in the environment, does it easily degrade, does it stay around and persist in soil, in sediment, in air. Is it generally known to be toxic? It is toxic to terrestrial life? Those are the animals, all from the pollinators, the bees and the butterflies, all the way up through the bears and the moose. We want to look at the whole thing. And that includes aquatic life: our oceans are in trouble, our animals are in trouble, we need to be protective of them - as much as we are for us and the things we are using, And I just thought, you know, if moms knew what I know and were able to shop for products that they knew, with confidence, had been vetted scientifically to make sure that they weren't using harmful ingredients well then they would do it. Ingredients: and that is exactly what we do : we bring you products that have been made entirely from a base of safe ingredients, using science to vet it. We do all the homework so that you don't have to. 2.What makes Made Safe different from other seals and certification programs out there? Number one, plain and simple; our science and our process for vetting and looking at ingredients is the highest bar that we have found around the world. Period. The end. Full stop. It is hard to be Made Safe Certified. We also go across categories, that means we don't just stick to beauty products or personal care or bedding or baby. We do all of that and more and so that makes our process very unique and that means that we can help you find items that you need in your every day life faster. The other thing that I would say is that we just can't be bought. Most certification programs are a little bit more flexible about the ingredients they use and maybe they were even started with and for a brand. We didn't do that. You cannot buy your way into this program, you have to earn it. It is totally legit, you have to use the ingredients because the bottom line is- we just wont compromise on your health. 3.What are your three non-toxic essentials? 1. My bed. I really believe in having a totally non-toxic detoxed sleeping environment: that is a big thing for me. We did a huge report last year on non-toxic bedding. So, number one, get the toxins out while you sleep so that your body can rest, rejuvenate, restore, refresh and get rid of the toxins which is what it is designed to do when you sleep. 2. Number 02 would be that I don't want to be drinking toxins and using toxins and committing plastics pollution each and every day so I use a stainless steel 100% plastic free water bottle - its a great thing to carry with you. I use it when I am travelling, I use it at home, I use it to monitor how much water I am actually drinking every day. 3. Then the third thing would be the beauty routine. I can't live without all my non-toxic goodies. At Made Safe we have tons of choices ... really cleaning up your beauty routine is a great idea because our skin absorbs as much as 60% of what we put on it- so make that stuff non-toxic! Plus it ends up going down the drain and Made Safe products wont harm the fish and the aquatic life and our oceans could use the help too. 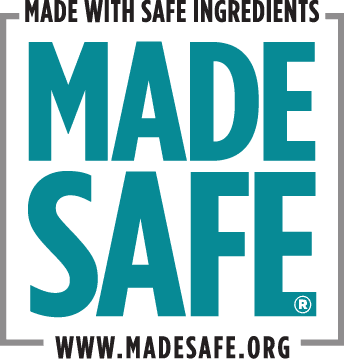 To learn more about Made Safe and fidn out what products already have the Made Safe certification head of the Made Safe Website.